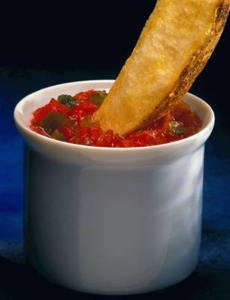 Salsa as a dip for french fries. Photo courtesy of Idaho Potato Commission. In 1494, Dr. Diego Álvarez Chanca brings the first chiles to Spain, after traveling to the West Indies on Columbus’ second voyage. He writes of their medicinal effect. Little is known about Dr. Álvarez Chanca, other than the fact that he was a physician-in-ordinary to Ferdinand and Isabella, King and Queen of Spain, and was appointed by them to accompany Columbus on his second voyage west in 1493. In 1529, Bernardino de Sahagún arrives and begins to document Aztec culture, which includes foods (and salsa). Also in 1898, according to GourmetSleuth.com, a cookbook published in the U.S. (although apparently in Spanish) contains two recipes for salsa fresca. Encaracion Pinedo’s El Cocerina Español (The Spanish Cook) includes recipes for Salsa Picante de Chile Colorado, a spicy red chile sauce, and well as Salsa de Chile Verde, a green chile sauce. 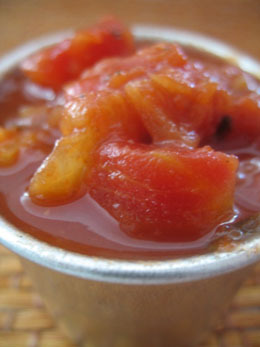 Peach salsa, the top seller in the U.S., was unknown to the Aztecs: the peach tree originated in China and moved west via Asia Minor. It came to the Americas with the colonists. Photo by Melody Lan | THE NIBBLE. And 20 years later, the big spurt in salsa sales began, as Americans from coast to coast discovered Mexican food.